Glascow, Scotland. Laid down at Harland & Wolf, Ltd. as a 2,770 BRT tanker for Curacaosche Scheepvaart Maatshappij (CSM). Completed. Registered at Willemstad, Curaçao, Netherlands Antilles. Assigned call sign TPEF and placed in the service of Anglo Saxon Oil Ltd., London. Ownership transfers to N.V. Nederlandsh-Indische Tankstoomboot Maatshappij. Registered at The Hague, Netherlands. New call sign PNTR, later changed to PGRN. Requisitioned by the Royal Netherlands Navy as an oiler and designated TAN 115. PAULA passes Thursday Island, en route from Balikpapan, Borneo to Cairns, Australia. Off Tandjong Priok (Batavia’s port). Scuttled by her crew to avoid seizure by the Japanese. Refloated, then undergoes repairs by the Japanese. Renamed ARARE MARU and assigned call sign JBWS. The Imperial Army (IJA) contracts operation of ARARE MARU to the Darien (Manchuria) Steam Ship Co., Ltd. Arrives at Singapore. Discharges fuel oil. Arrives at Palembang. Loads fuel oil. Arrives at Pangkalan Susu. Loads fuel oil. Undergoes salvage and repairs, most probably in Singapore. Arrives at Singapore. Discharges fuel oil. That same day, the IJA’s contract for operation of ARARE MARU is renewed with Darien Steam Ship Co., Ltd. Arrives at Palembang. Loads fuel oil and later that day departs. Departs Palembang and arrives at Singapore. Discharges fuel oil. Arrives at Palembang. Loads fuel oil and departs later that day. Arrives at Port Swettenham (Port Klang) Malaya. Discharges fuel oil. Arrives at Djakarta. Discharges fuel oil. Rear Admiral (later Admiral of the Fleet/Sir) Philip Vian’s British Task Force 65 launches a successful air strike of 92 “Avengers” and “Firefly” bombers escorted by “Hellcat” and “Corsair” fighters from HMS INDOMITABLE, VICTORIOUS and INDEFATIGABLE. Two aircraft are lost, but their crews are rescued. Heavy damage is inflicted on the Pangkalan Brandon refinery. About a dozen Japanese aircraft are shot down and about 20 are destroyed by strafing attacks on nearby airfields. Arrives at Palembang. Probably loads fuel oil and departs later that day. Arrives at Singapore. Discharges fuel oil and later that day, departs. At 0600, Rear Admiral’s British Task Force 63’s (later renamed the British Pacific Fleet) launches a successful air strike on the oil refinery at Pladjoe, north of Palembang. The strike consists of 43 “Avengers” and 12 “Firefly” fighter-bombers armed with rockets escorted by 50 “Hellcat”, “Corsair” and “Seafire” fighters from HMS INDOMITABLE, VICTORIOUS and INDEFATIGABLE. 32 British aircraft are lost due to Japanese action and crash landings. Later that day, arrives at Palembang and loads fuel oil. Arrives at Palembang. Possibly in a minor collision with 1,189 GRT tanker KYOEI MARU No. 3. Loads fuel oil. Singapore. Found sunk and wreck taken over by British Forces. Refloated and returned to Nederlandsh-Indische Tankstoomboot Maatshappij, NEI and placed in their service. Transferred to Nederlandsh-Indische Tankvaart Maatshappij, NEI and placed in their service. Sold to an unknown firm in Singapore and converted to a dredger. The center of oil production in Sumatra was at Prabumulih, about 70 km from Palembang. The crude was transported via pipelines to the former Royal Dutch Shell oil refineries under IJA control at Pladju (Pladjoe) a few miles from Palembang and to Soengaierong (Sungei Gerong) east of the city refinery. The 3,900 mile flight from Ceylon to Palembang and back was the longest single-stage flight undertaken by USAAF combat aircraft in WWII. For further information please see "Operation Jaywick"
 The IJA also operated the former Royal Dutch Shell oil refinery at Pangkalan Brandan in northern Sumatra. The oil was transported from port facilities at nearby Pangkalan Susu. The IJA used mostly smaller captured tankers to transport the oil across the Musi (Moesi) River and to carry the oil from Sumatra to Singapore for shipment to Japan. Some sources claim that at an unknown time ARARE MARU was renamed NANJO MARU. This may have occurred when the vessel was transferred from Army to Navy control. 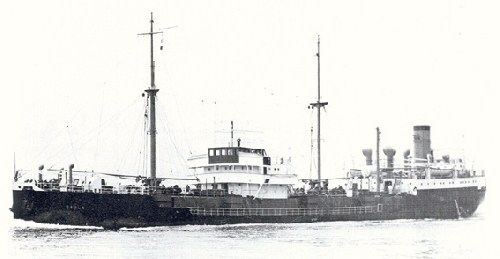 The ship was called reason ARARE MARU as late as Sep '44 probably because she continued to be known by her Army number. Thanks go to Peter Cundall of Australia.